Titus has discovered the catmint in the coldframe. He really likes it... Yes, he's sitting in the pot. 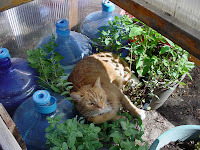 Fortunately catmint is tough! The water bottles are there as a temperature regulator, btw.